I got this as an e-book from google books, which I thought was pretty cool. The price was quite low compared with the usual price of an academic book of this sort. I bought this after reading "The System of Transcendental Idealism". I was very interested in his theory of art. This work is strange though. "The System..." is more of a general philosophical work but the theory of art is very important, in fact art is placed above philosophy. 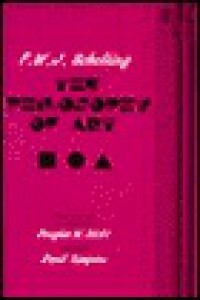 Here in "The Philosophy of Art" though the situation is reversed. Philosophy is placed above art. Furthermore there is some really weird material about the ancient Greek religion being the perfect religion and using it as the basis for his philosophical analysis which seemed to me did a lot of violence to both the religion and the philosophy.